To evaluate intersession and intrasession repeatability of aberration data obtained with a new visual simulator based on adaptive optics, which includes a Hartmann-Shack aberrometer (Adaptive Optics Vision Analyzer; Voptica S.L., Murcia, Spain). Thirty-one healthy right eyes were included in the study. To evaluate intrasession repeatability, three consecutive measurements without repositioning the patient or realigning the eye were obtained. Intersession repeatability was evaluated in three sessions. Aberrometric data computed from the second to the fifth order for a 4-mm pupil were used. Statistical analysis included the repeated measures analysis of variance (or the Wilcoxon signed rank test), the coefficient of repeatability, the Bland–Altman method, and the intraclass correlation coefficient. No significant differences in the intrasession and intersession repeatability analysis for any of the parameters (P > .05) were found, suggesting a consistent variability of the instrument over time. Similar coefficient of repeatability values were obtained in the three sessions. The Bland–Altman analysis confirmed differences close to zero and the variations were independent of the mean within and between sessions. The intersession intraclass correlation coefficient values were generally above 0.75, suggesting moderate to high repeatability. However, some exceptions were found in the intrasession analysis. The findings suggest that the new instrument provides consistent and repeatable aberrometric data. It is therefore a suitable tool to perform consistent and repeatable visual simulations. From the Centre for Sensors, Instruments and Systems Development (CD6), Polytechnic University of Catalonia, Terrassa, Barcelona, Spain. Supported by the Spanish Ministry of Science and Innovation under the grant DPI2011-30090-C02-01 and the European Union. The authors have no proprietary or financial interest in the materials presented herein. Optical aberrations affect human vision. Aberrometers allow fast and reliable measurements of lower- and higher-order aberrations in clinical practice.1,2 The most commonly used aberrometers are based on the Hartmann-Shack technique,3–5 and the Zernike polynomials are often used to describe the ocular wavefront aberration function.6 A new instrument based on this technique that combines an aberrometer with adaptive optics technology (Adaptive Optics Vision Analyzer; Voptica S.L., Murcia, Spain) has recently been commercially available.7,8 Adaptive optics is mainly used to improve the performance of optical systems by reducing the effect of wavefront distortions; some ophthalmic systems9–12 already apply it to improve the quality of the displayed images. This new instrument includes a spatial light modulator capable of performing visual simulations such as correcting or inducing certain aberrations, measuring visual acuity, contrast sensitivity and glare, simulating different optics such as lenses and refractive profiles in a noninvasive manner, and combining optical and visual testing at any distance. Before using a commercial ophthalmic instrument as a diagnostic tool, it is crucial to ensure that repeated measurements give consistent results. This study evaluated the repeatability of aberrometric data obtained with this new instrument in a population of healthy participants with good vision. The study compared within-session repeatability (with no repositioning of the participant or realignment of the eye) and between-session repeatability (repositioning the participant and realigning the eye). Such studies are essential, because clinical assessments are often made in different sessions. This prospective study was conducted on healthy participants recruited from the staff and students of the Polytechnic University of Catalonia (Terrassa, Barcelona, Spain). Participants with corrected distance visual acuity of 20/20 or better, spherical correction less than 5.00 diopters (D), astigmatism less than 3.00 D, and no history of ocular disorder were invited to take part. Soft contact lens wearers were instructed not to wear them for at least 1 day before measurements. Furthermore, only participants with pupil diameters of 4 mm or greater in mesopic conditions were included in the study. No mydriatic agents were used. The research followed the tenets of the Declaration of Helsinki and all participants gave written informed consent. Thirty-one right eyes of 31 participants (13 males and 18 females) were finally included in the study, with a mean age ± standard deviation (SD) of 26.5 ± 5.8 years (range: 18 to 52 years), corrected distance visual acuity in decimal notation of 1.01 ± 4 · 10−3 (Snellen equivalent 20/19.80), manifest spherical refractive error of −1.26 ± 1.93 D (range: −4.75 to +3.75 D), and cylinder of −0.76 ± 0.74 D (range: −3.00 to 0.00 D). Following international standards of repeatability,13 all measurements were taken by the same operator in the same laboratory with the same equipment. Room illumination was kept low and constant during measurements. In addition to the standardized routine examination (visual acuity, manifest refractive error, and natural pupil diameter), measurements of monochromatic ocular aberrations were obtained using the Adaptive Optics Vision Analyzer (software v1.1.12), which has two operating modes: the Wavefront Measurement and the Vision Analysis. The first uses a Hartmann-Shack aberrometer to measure the Zernike coefficients up to the eighth order for a specific pupil size. It is used to determine the refractive error, the higher-order root mean square (RMS), and the total RMS. In the Vision Analysis mode, the operator has full control over the visual stimulus as seen by the participant (ie, the wavefront profile can be modified by means of adaptive optics). In this study, aberrometric data were recorded three consecutive times in three different sessions. Time between sessions was 10 minutes, which allowed the assessment of intrasession and intersession repeatability, similarly to other ophthalmic instruments.14–18 At the beginning of each session, the participant was properly positioned and the participant’s right eye was aligned with the instrument while an occluder was applied to the left eye. Next, three consecutive measurements without repositioning or realignment of the eye were made. No refractive corrections were worn and the participant was instructed to blink just before the measurement and then to blink freely to minimize the effect of tear film instability. Taking into account that in healthy eyes the most significant higher-order aberrations are within the third and fourth orders and that the second order is important for determining refraction,6,19 we evaluated aberrations from the second to the fifth order. Ocular aberrations were computed for a 4-mm pupil. The following aberrometric data were used: individual Zernike coefficients from the second (Z2m) to the fifth order (Z5m), with m being the angular frequency; the radial RMS from the second (RMSrad2) to the fifth order (RMSrad5); the RMS of higher-order aberrations computed from the third to the fifth order (RMSHOA); the total RMS computed from the second to the fifth order (RMSTOT); and the spherical and cylindrical refraction. Aberrometric data were expressed in micrometers (μm) and refraction data in diopters (D). All data were entered in a database (Excel; Microsoft Corporation, Redmond, WA) and transferred for data analysis (SPSS version 17.0 for Windows; SPSS, Inc., Chicago, IL). P values of .05 were considered statistically significant. Repeatability was analyzed as follows: to determine whether there were intrasession differences, the first, second, and third consecutive measurements in the first session were compared (intrasession repeatability). When parametric analysis was possible, the repeated measures analysis of variance was used for data comparison. If parametric analysis was not possible, the Wilcoxon signed rank test was used. To determine whether there were intersession differences, the same analysis was subsequently used with the averaged results obtained in the first, second, and third session (intersession repeatability). Next, the intrasession repeatability of each parameter was determined using the coefficient of repeatability (COR) (1.96 times intrasubject SD), which represents the value below which the difference between two repeated measurements from the same session are expected, with 95% probability.20 The mean COR for each session was obtained adding the square of the individual CORs for each individual eye and calculating the square root of the mean value. The intrasession and intersession repeatability for each parameter was also assessed with the Bland–Altman method.21 Specifically, we used the first and second measurements and the first and third measurements of the first session to assess intrasession repeatability. However, we compared the mean values of the three consecutive measurements in each session between the first and second sessions and the first and third sessions to establish intersession repeatability. Finally, an intraclass correlation coefficient (ICC) test, a measure of the reliability of measurements, was also performed.22 This correlation measures the relative homogeneity within groups (between the repeated measurements) in relation to the total variation. The ICC approaches 1.0 when the variability within repeated measurements is zero and low intraobserver repeatability is generally assumed when ICC values are below 0.75. In this study, we used a two-way mixed analysis. The three measurements of the first session for each participant were considered to account for intrasession repeatability. Intersession repeatability was studied by means of the analysis of the nine measurements obtained in the first, second, and third sessions. Table 1 shows the mean of the sphere and cylinder obtained in the three sessions. The mean of the intrasubject SD (SS) is also shown. Values of Ss less than 0.25 D, and thus not clinically significant, were obtained. Figure 1 shows the mean Zernike coefficients and RMS values obtained in the three sessions. 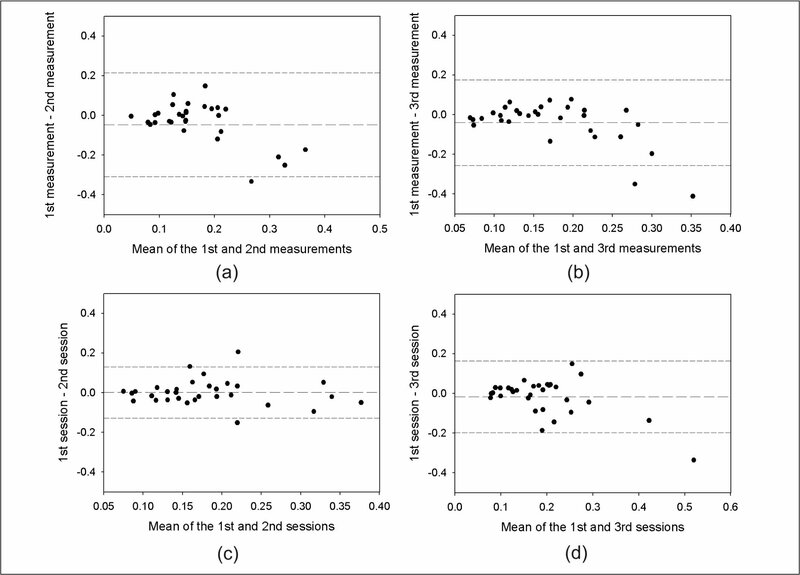 Mean (A) Zernike coefficients and (B) root mean square (RMS) values of the measurements carried out during the three sessions. Values are in micrometers (μm). For each parameter, no significant differences in the intrasession repeated measures analysis of variance (or the Wilcoxon signed rank test if needed) and the intersession analysis were found (P > .05), suggesting that the variability of the instrument remained constant over time. 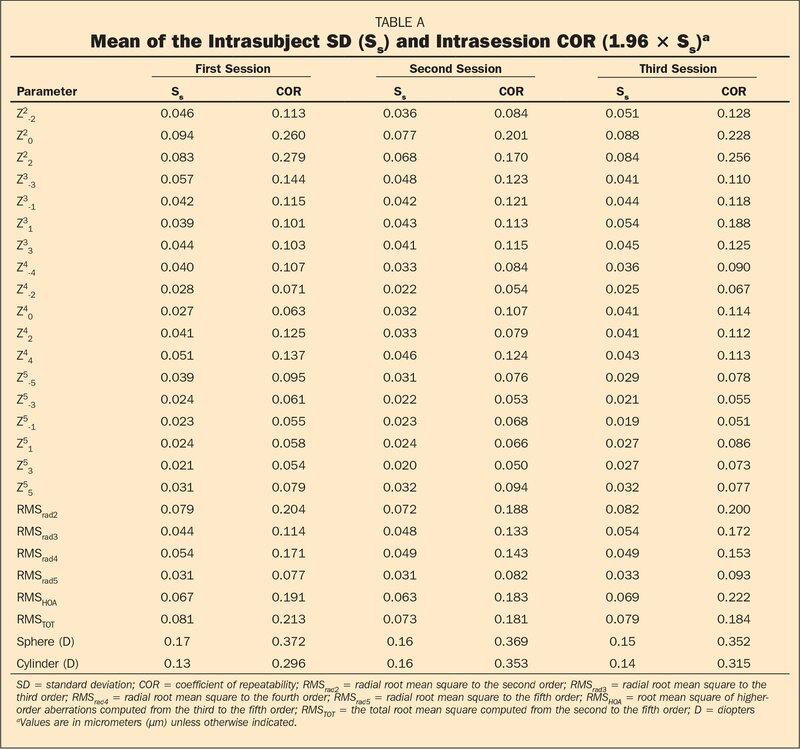 The three mean intrasession COR values obtained for each different session are shown in Table A (available in the online version of this article) together with the Ss. Table A also shows that the values obtained are similar for the three sessions considered. Table B (available in the online version of this article) shows the mean of the differences (meand) and the corresponding 95% confidence limit for the parameters within the first session, when the first and second measurements and the first and third measurements were compared (Bland–Altman method). Table C (available in the online version of this article) shows the same results but for the comparison of the different sessions (ie, the first and second sessions and the first and third sessions). Figure 2 shows the Bland–Altman graphs for the RMSHOA, where mean differences close to zero were obtained when comparing measurements within the first session and between sessions. Furthermore, similar or slightly better intersession than intrasession repeatability was observed for each parameter using the Bland–Altman method, suggesting that the repositioning or realignment of the eye had a relatively small (although useful) impact on the results. The Bland–Altman analysis also confirmed that the variations were independent of the mean because the plots did not show bias between the mean and the differences, for both the intrasession and intersession repeatability analysis. Plots showing the mean of the differences and the corresponding 95% confidence limit for the root mean square of higher-order aberrations computed from the third to the fifth order parameter when the (A) first and second measurements and (B) first and third measurements of the first session were compared. The differences when the (C) first and second sessions and (D) first and third sessions were compared are also shown. Values are in micrometers (μm). 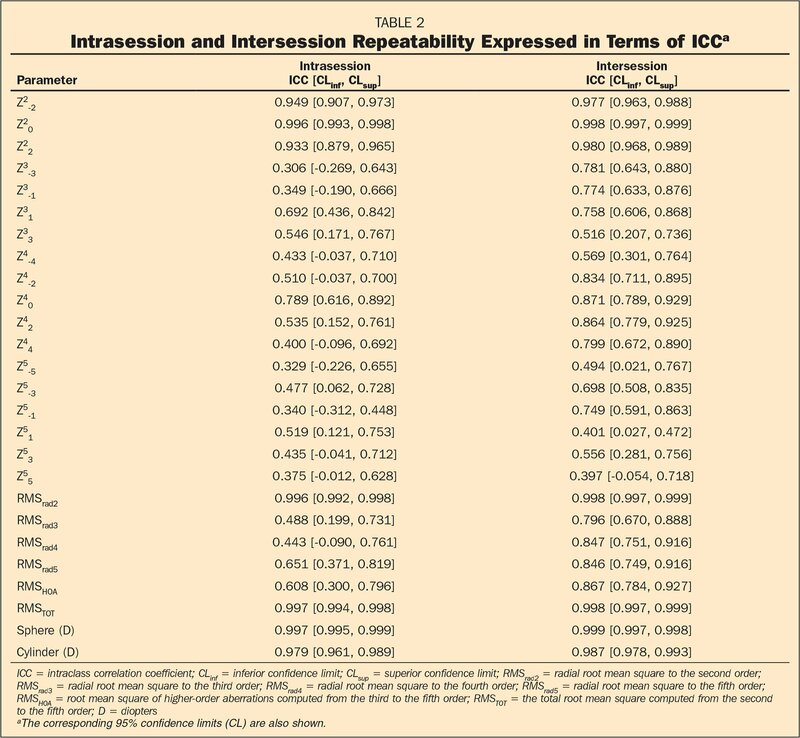 Finally, Table 2 shows the ICC for intrasession and intersession repeatability; values of ICC above 0.75 were obtained for many parameters analyzed in the intersession analysis, which we interpreted as moderate to high repeatability. On the other hand, where the parameters were linked to lower ICC values, mainly for the intrasession analysis, a poorer repeatability was achieved. This could be partially explained by a lower number of measurements included in the analysis of intrasession repeatability. 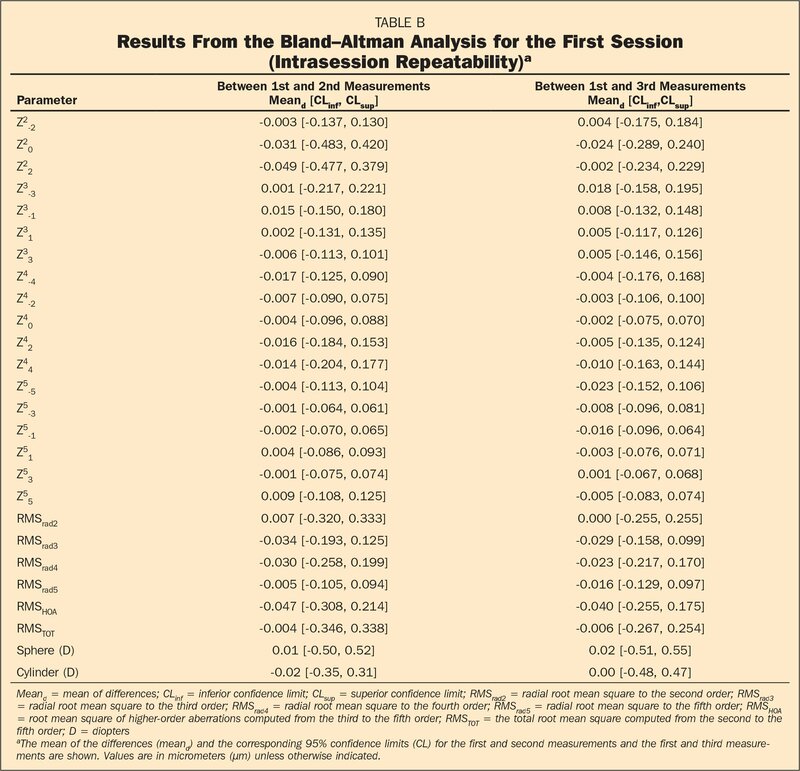 Moreover, it is in agreement with some of the former Bland–Altman results where intersession repeatability was slightly better for some specific parameters than that obtained for the intrasession analysis. In addition, lower-order aberrations seemed to be associated with a better repeatability than higher-order aberrations when the ICC analysis was done. Overall, better results were obtained with RMS values than with some individual Zernike coefficients. The availability of commercial adaptive optics technology has generated a great interest in aberrometry. In this study, the repeatability of aberrometric data of a new instrument based on the Hartmann-Shack sensor was evaluated. The results show good overall repeatability. With regard to the assessment of objective refraction, the instrument showed low variability for the sphere and the cylinder (mean intrasubject SD values from 0.13 to 0.17 D) (Table 1). These values are below the limit of 0.25 D used in clinical practice and thus have little impact on clinical outcomes. These results are similar to those reported by authors using other commercial instruments also based on Hartmann-Shack sensors. Specifically, López-Miguel et al.18 found intrasubject SD values for the spherical and astigmatic component of 0.20 and 0.40 D, respectively, with an integrated topographer and a Hartmann-Shack wavefront sensor (Topcon KR-1W, Tokyo, Japan). Piñero et al.23 found a within-subject SD of 0.05 D for astigmatism when performing three consecutive measurements with the same instrument. Miranda et al.20 also found a small variability in lower-order aberrations; they reported that the average SD of the differences produced an equivalent defocus of 0.045 D. Mirshahi et al.24 reported mean intrasession Ss of 0.15 D for the sphere value and 0.16 D for astigmatism. They obtained six consecutive measurements of each eye after pupil dilation. Hofer et al.25 did not find differences in aberration between natural accommodation and cycloplegia. We found similar results to those found by Mirshahi et al., although we obtained the measurements without cycloplegia. With respect to higher-order aberrations, no significant intrasession and intersession differences were found, suggesting that the repeatability of the instrument was constant over time. This agrees with the results of Miranda et al.,20 who analyzed aberration data over 1 week. Moreover, they obtained COR values similar to ours and they found the largest variation in the total higher-order aberrations, for which a COR value of approximately 0.1 μm was obtained. In our study, the COR value for the RMSHOA parameter was slightly higher, at 0.191, 0.183, and 0.222 μm for the first, second, and third session, respectively. In addition, Mirshahi et al.24 reported an intrasession Ss of 0.097 μm for the RMSHOA, whereas most other aberration coefficients had lower values. In our study, the intrasession Ss was just below 0.07 μm for the total higher-order RMS in the three sessions (Table A); the other parameters measured were also linked to lower Ss values. Visser et al.26 also reported good repeatability values for two Hartmann-Shack aberrometers, the IRX-3 (Imagine Eyes, Paris, France) and the Keratron Onda (Optikon, Rome, Italy), with mean SD values below 0.1 μm for both aberrometers in all higher-order aberrations and slightly larger values (0.1 to 0.2 μm) for second-order aberrations. In contrast, in our study the intrasession Ss was always below 0.1 μm. On the other hand, although Cheng et al.27 reported statistically significant differences in a large number of Zernike coefficients when performing twenty sequential measurements with a Hartmann-Shack sensor, they concluded that pupil realignment was critical to minimize variability. 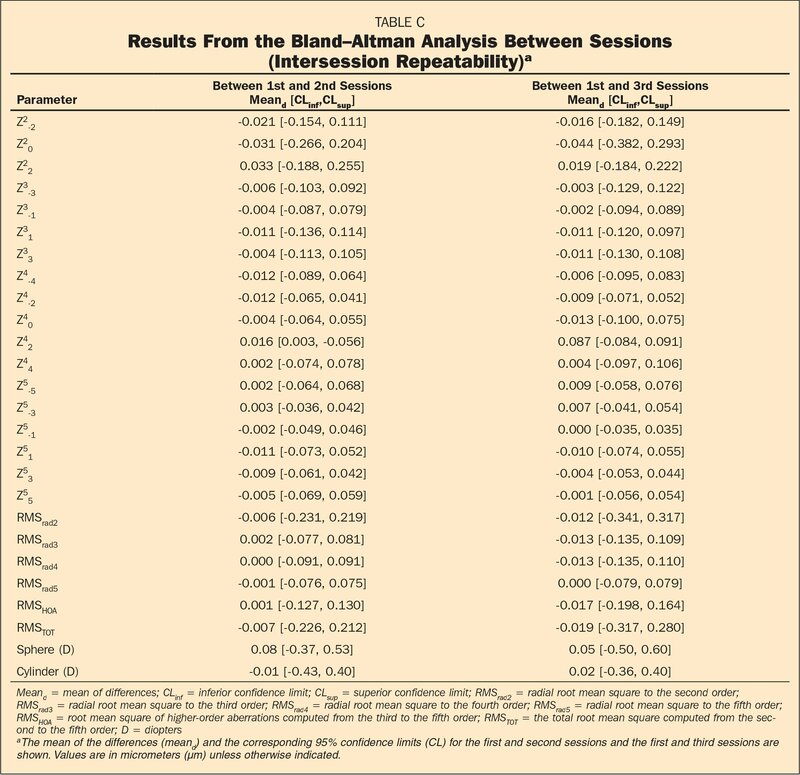 These results agree in our study with the slightly better results obtained in some parameters for the Bland–Altman intersession analysis than for the intrasession analysis (Tables B–C). However, the statistical analysis of intrasession repeatability compared three independent measurements, whereas the intersession analysis considered the average of three measurements taken during each session. The Bland–Altman analysis in our study did not show a trend based on the mean value of the aberrations, similarly to what other authors have already reported with other instruments20 (Figure 2). The results of the ICC analysis showed good repeatability, in particular for the intersession analysis where ICC values above 0.75 were obtained for most parameters analyzed. Nevertheless, a lower repeatability was observed when the intrasession analysis was done. The ICC values obtained in this study are similar or slightly lower than those found by Piñero et al.,23 who reported ICC values above 0.75 for most parameters analyzed when three repeated automatic consecutive measurements were obtained by the same examiner. No pupil dilation was used for the measurements and a 4-mm pupil was considered in the calculations. A higher variability was observed in the repeated measurements of RMS values corresponding to primary coma, secondary astigmatism, and tetrafoil. In our study, these parameters were linked to low ICC values in the case of the intrasession repeatability analysis. However, fifth order coefficients also presented poor values. López-Miguel et al.18 studied intrasession repeatability (nine consecutive measurements) and intersession reproducibility (two consecutive sessions 1 week apart) for a 6-mm pupil. Intrasession repeatability ICCs showed good results for higher-order aberrations (> 0.85). The day-to-day variability of the system was not as good as that obtained during a single session (> 0.71). These results contradict the results found in this study, because for ICC better results were reported for the intersession analysis than for the intrasession analysis. It could be possibly explained by the difference in time between sessions: whereas López-Miguel et al. evaluated two consecutive sessions 1 week apart, the sessions in our study were separated only by 10 minutes. Furthermore, the average of three measurements in each session and three independent measurements for the intrasession analysis were taken into consideration in our study. Several repeated measurements of ocular aberrations are recommended to avoid instrument variability. In addition, when considering the Zernike polynomials in ascending order, our results showed a tendency toward decreasing absolute repeatability (ie, intra-subject SD and CORs). These results agree with similar studies17,24 that measured larger relative repeatability errors for higher orders. Finally, variability between measurements over time may be attributed not only to the instrument and its precision but also to changes in the properties of the light reflected from the retina25 and to changes occurring in the eye during measurements.27 Indeed, aberrations are dynamic because they can be directly affected by microfluctuations of accommodation, instability of the tear film, and fixation micromovements of the eye. The operator might also have an impact on variability because the instrument used is not fully automated (ie, operators are in charge of placing the patient and focusing and centering the eye during measurements). Our findings suggest that the new instrument for vision analysis based on adaptive optics provides consistent and repeatable aberrometric data and can thus be used to obtain consistent and repeatable visual simulations. International Organization for Standardization. Accuracy (Trueness and Precision) of Measurements Methods and Results (ISO 5725: 1994). Geneva: Author; 1994. Vilaseca M, Arjona M, Pujol J, Peris E, Martínez V. Non-cycloplegic spherical equivalent refraction in adults: comparison of the double-pass system, retinoscopy, subjective refraction and a table-mounted autorefractor. Int J Ophthalmol. 2013;6:618–625. Weir J. Quantifying test-retest reliability using the intraclass correlation coefficient and the SEM. J Strength Cond Res. 2005;19:231–240.